Adopted woman looking for long lost sister finds her living next door after 20 years of search! After years of searching went fruitless, the woman found her birth family living right next door. Sisters share their birth father and have been neighbors for almost a year now! If you ask a person who has only known his/her family to be missing or a search in progress, one may chance upon the longing and frustration of the lost time and the fruitless efforts. The anticipation sprung from whispers of knowledge that their family is calling to them and they may not be close. Quite similar to this scenario was of an adopted woman in Wisconsin; who had spent years looking for her birth family. Her pursuit, though started out as cold and dry as ever but concluded with a twist that would make one wonder how mysteriously fate works for us. According to a report by the Daily Mail, Hillary Harris’s story began as an adopted infant who soon learned that her birth family was still out there. She had been looking for her biological parents for seven years but was nowhere close to finding them. 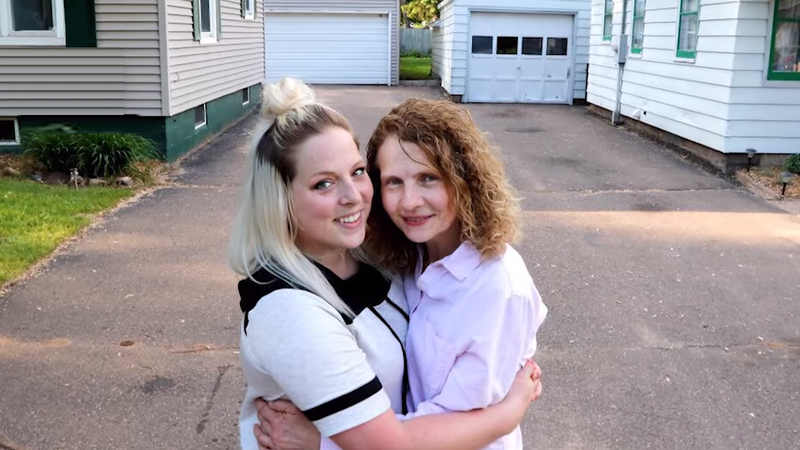 The 31-year-old knew very little about her birth family apart from the information about her half-sister named Dawn Johnson being out there somewhere in Greenwood, Wisconsin. Harris’ numerous efforts to search for her sister didn’t yield substantial results. Countless Facebook searches for the name ‘Dawn’ had come up short. The end of the tunnel bore no light for Harris until a couple moved next door to her house in Eau Claire, Wisconsin. The mother-of-one knew very little about what she was going to find. Hillary’s states that her five-year-old daughter Stella took an instant liking to the new neighbors and would go over to play at their house on a regular basis. Hillary admits being a little hesitant about her daughter’s attraction to Dawn, afraid that she was bothering a neighbor who she was not very social with. The women recall being very formal and exchanging rare hellos and cordial greetings, but there was no interaction beyond that. Surprisingly, Hillary was aware that Dawn hailed from the same city as her long-lost sister. However, she silenced her hope-filled thoughts since it was difficult to say anything without knowing her neighbor’s last name. The times didn’t take much to change when a package meant for Dawn landed up in Hillary’s and Dawn’s shared driveway. As you may have guessed, Hillary picked the package and the name ‘Dawn Johnson’ meant more way more than what met the eye. “Her name is Johnson, it's Dawn Johnson, she's from Greenbrook. It's got to be her,” Hillary recounts telling her husband over the phone. Hillary contemplated over what she had just discovered and kept her calm for a few days. Hillary was finally able to muster up the courage to bring this discovery to Dawn’s attention and reveal their connections. "I said, 'No, I'm not going to go ask her','' Hillary said. 'What if she never knew about me? What if it's a secret?' After a little encouragement from her husband Lance, Hillary texted Dawn. Both the women learned that have the same biological father, Wayne Clouse, who had died in 2010. Dawn recalls being raised by her stepfather and had met her birth father only when she was 18 years old. Dawn also admits that she never considered that her father would have other off-springs but Hillary being her half-sister made perfect sense. "She's the missing puzzle piece I have been looking for so many years," she told The Washington Post. "I'm very happy to have a wonderful neighbor, also my sister," Dawn said. "And I get to watch my niece! And she gets to play and I get to feel young." Hillary is now urging those struggling to locate their biological family to not give up. "Keep looking. Look everywhere. Go look next door. You don't know what you'll find," she said.